Our Gift Box contains one dozen cookies. 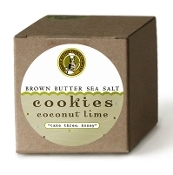 The Coconut Lime Brown Butter Sea Salt cookies are made with coconut butter, coconut flakes and fresh lime zest. Enjoy!